I read somewhere about a year or so ago that cats don’t experience jealousy. I don’t remember the author but I do remember he had letters after his name so he was some kind of expert. I suppose if I was paying attention I would have noticed those letters to be “BS” because, even then, I knew he could not have possibly had cats. Cats can certainly be jealous. I know that because I live with Chris, who, if he was human, would be like the crazy ex-girlfriend who breaks into your house to go through your computer history (yes, that happened to me). I know Chris is an extreme case but I see evidence of jealousy sometimes in our other cats. Floki, for example, will get mad at Chris if he is in the bedroom with Mom in the morning when Floki likes to get attention from her. If a new box is introduced, there can be fighting over who gets first dibs on getting inside. I don’t know if that is jealousy or its evil sibling, envy, but it’s so similar who’s counting. Here is Chris while Frankie is on my lap. Can someone tell me that this is not jealousy? 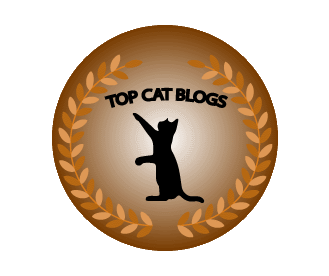 This entry was posted in Uncategorized and tagged Cats, funny, Jealousy on August 9, 2018 by Charles Huss. Saturday Rose and I were discussing Valentine’s Day and she surprised me by saying that instead of jewelry, I could get her a Bengal cat. She then added that a Snowshoe cat would be acceptable too. We happened to be near a shelter called The Suncoast Animal League (where I once volunteered) so we decided to look there. There was a female Siamese cat that I thought was very friendly but Rose didn’t like her eyes. They were blue around the outside and had a reddish glow in the middle. Rose thought she looked evil but I would have taken her. Next we went to The Humane Society of Pinellas County in Clearwater. I was impressed with how the cats were housed there. They had very large cages outside but under cover. Each cage was (and I’m guessing) about five feet by ten feet and housed between two and four cats. The cages were tall and there were structures for the cats to climb on or go inside. If I was a cat waiting for my forever home, I would want to wait there. While we were there we saw a black and white kitten named Wilma. She was a frisky little girl and Rose liked her but someone else was in the cage with her so we decided to look around and come back. When we did come back that other person had already committed to adopting her. From there we went to Petsmart in Clearwater, not far from the Humane Society. We found a three-year old gold and white cat that seemed very friendly. When he was brought out of the cage he immediately climbed on my shoulders, just like Chris did when I met him. Actually, Chris dug his claws in my back and scaled me like a mountain so it may not have been just like that. He then went to Rose’s shoulders and started treading (Rose calls it Marching) on her sweater while holding a piece of it in his mouth. 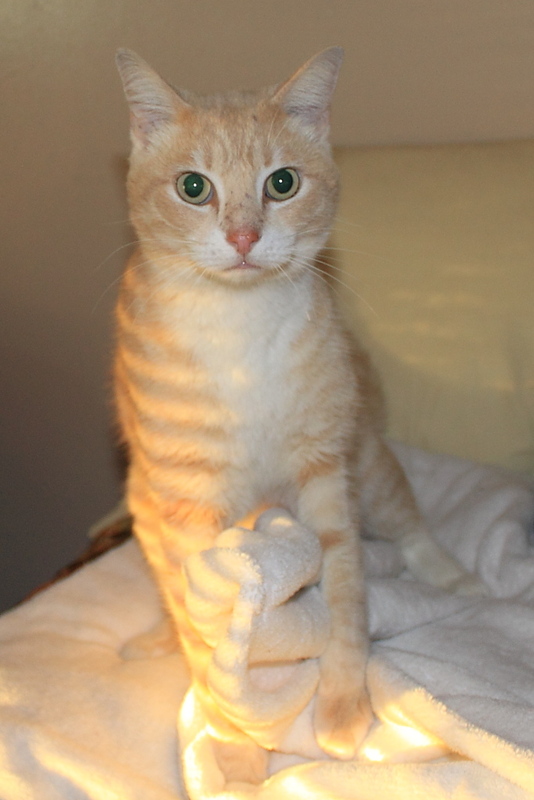 We decided to adopt him even though he was not the female Bengal or Snowshoe Rose was looking for. He was from the Pinellas County Animal Services and didn’t even have a name, just a number, B311304. We had to change that because we couldn’t call him B311304. I mean it is hard to remember. What if I accidently called him B311340? I wouldn’t want to confuse the little guy. Rose decided to name him Frankie after the Snowshoe cat that we wanted months ago but waited too long to decide and lost him (see here). When we got him home we didn’t separate him from the other cats, which we should have, but Chris has never given a new cat a hard time and Puck is so friendly we didn’t think there would be a problem. We opened the cage door in the living room and the cat made a beeline for the spare bedroom and under the bed, where he remains as I write this. He came out for five or ten minutes on Sunday while we had the door closed and the other cats locked out. He was very friendly and let us pet him but he then went back under the bed and did not come back out until after we left for work yesterday (Monday). Frankie was out from under the bed for a short time Sunday. Frankie was “marching” and sucking on the blanket. When I got home yesterday evening from work, he was lying on the bed in the spare bedroom. I closed the door that morning so he could have peace from the other cats and it seems to have worked. He let me pet him for a good ten minutes while Chris sat at the doorway staring. I got up and pet Chris too so he wouldn’t feel left out. Eventually Frankie got tired of the attention and batted at my arm and hissed at me. 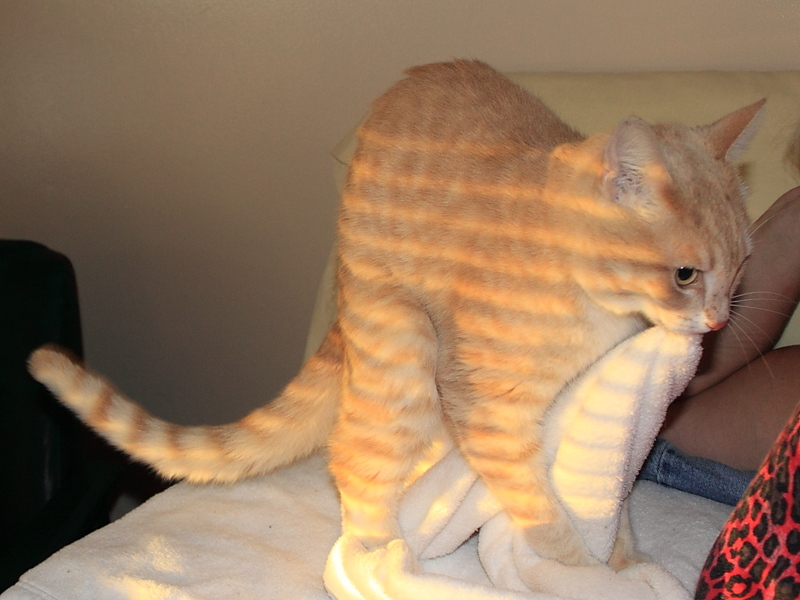 Our cat Sneakers used to come around for attention and then bite you when he had enough. I hope he is not going to be like that. I did notice he did not extend his claws when he batted me. We were not informed that he was declawed (which I would never do to an animal) so I need to check that when I can do it without upsetting him more. Frankie eventually ended up back under the bed again. I’m a bit worried because, as far as I can tell, he has only used the litter box I left in the bedroom once since Saturday. I plan on closing him inside the bedroom again today. Hopefully he will come out and do his business. This entry was posted in Uncategorized and tagged Adoption, hiding, introduction, Jealousy, new cat on February 11, 2014 by Charles Huss. 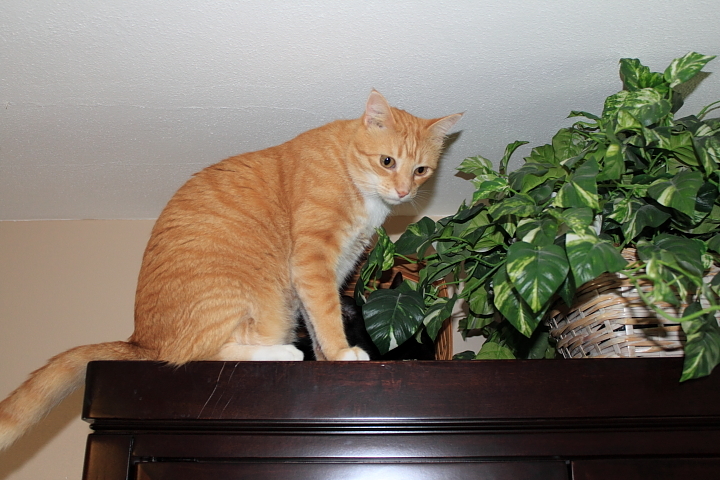 Getting on top of tall things like the china cabinet has always been Chris’s area of expertise. 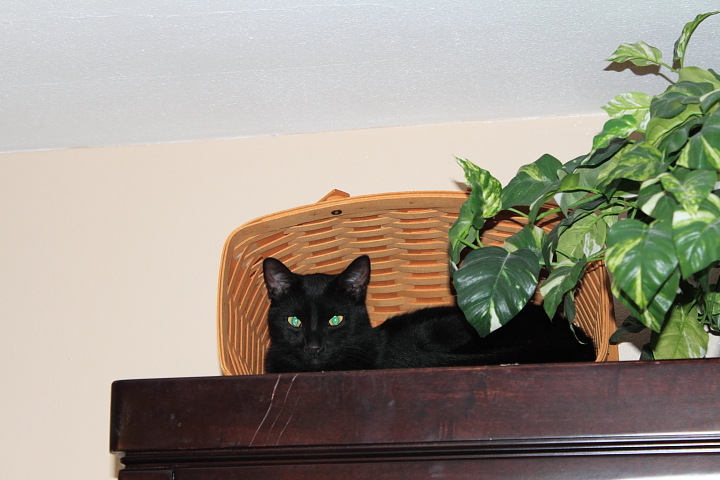 Puck usually just watched as Chris traveled the upper reaches of our home like Tarzan swinging through the vines. But he did more then watch; he learned. 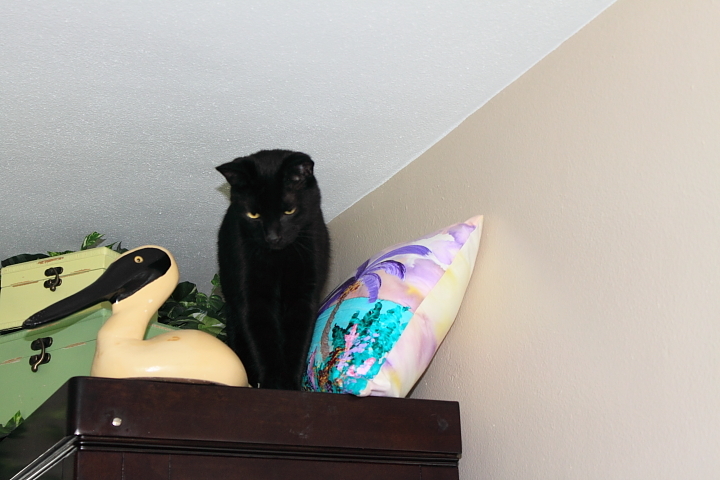 Now Puck is able to get on top of the china cabinet like an old pro. He even climbed inside one of Rose’s baskets one day so we decided to turn it on its side and now it is like a little penthouse with a view. It seems to be his second favorite place to be, right behind the top of the couch overlooking our living room window. 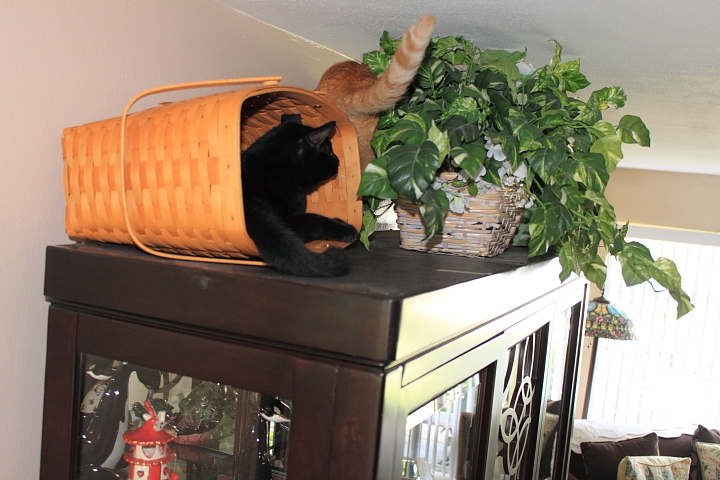 Of course, one cat can’t do something interesting without the other getting jealous and wanting to join in. So was the case this day when Chris spotted Puck in his “penthouse” and wanted to see if there was anything he could do to annoy him. In the end, Chris got bored and was off to a new adventure, leaving Puck alone to enjoy some peace and quiet. Dad! Tell him its my turn! I’ll wait ’till you’re done. I can’t wait. I have things to do. 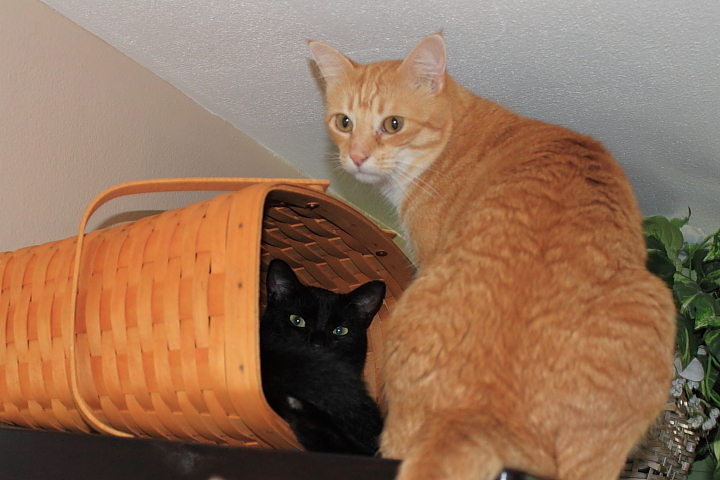 This entry was posted in Uncategorized and tagged cabinet, Cats, Jealousy, Photo Friday on September 27, 2013 by Charles Huss. Keep in mind that I have a hard enough time trying to figure people out so interpreting the behavior of another species could be beyond my ability. Nevertheless, I feel Chris is the Alpha male in the house and he feels threatened by the kitten. I have seen behavior from Chris that is different now than it was before Puck showed up. For example, he sometimes will grab Puck or Tigger by the scruff of the neck and hold them down for an extended period, as if he is reminding them who is the boss. There is also something that he does not do that somewhat bothers me. 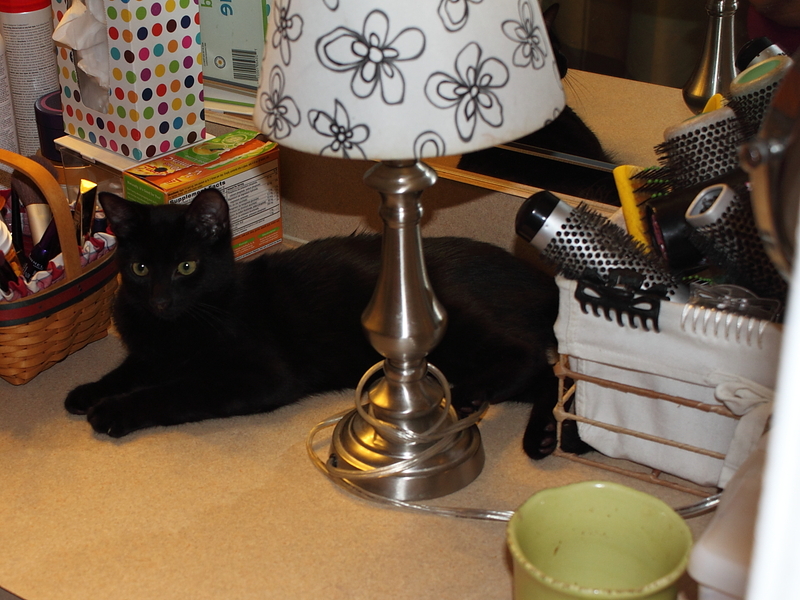 Rose gets ready for work every morning by sitting at the counter in the bathroom. Chris used to lay on the counter while she got ready. He was somewhat of a nuisance for her but also a source of entertainment. He would lie there and grab her makeup or whatever he could get his paws on and pull it toward him. Now Puck has taken over his spot so Chris usually just avoids the bathroom in the morning. That makes me feel bad because that was part of his routine that was taken away from him. Of course, Chris could easily take that spot back if he wanted to, so I am not sure why I feel bad about it. Perhaps it is because he does not want to take it back. All things considered, Chris is generally a happy cat and I believe puck has added to his life more than he has taken. Eventually, Chris will reestablish his dominance and all will be right with the world. Well…maybe not the world. This entry was posted in Uncategorized and tagged Alpha, Bad Cat Chris, cat, Jealousy, kitten on December 11, 2012 by Charles Huss.